My freshman year at Loyola I made the mistake of only ever ordering coffee at Engrained. 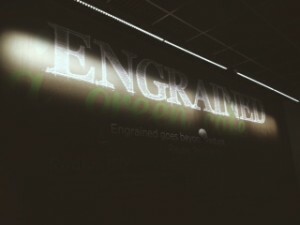 Don’t get me wrong the coffee is great, but Engrained is so much more than a coffee shop. With offerings ranging from a Loaded Grilled Cheese to the best cake balls you’ll ever eat, you need to explore the menu here. At their location inside the Institute of Environmental Sustainability it’s appropriate that Engrained shares the same goal of running an environmentally friendly business. The waste from the kitchen is nearly 100% compostable. Eventually they hope the waste from the dining area will reach the same standard of eco-friendliness. A few other world-saving features of the cafe are found in things you normally wouldn’t think twice about. The chairs you sit on are actually 111 Coke bottles, the tables are reclaimed Chicago wood, and the floors are made of cork. Kudos to Engrained for stepping outside the box to help take care of the planet. Engrained’s menu is completely unique thanks to their commitment to sourcing nearly all of their food within a 150 mile radius of their location. Their partnerships with local farms and businesses mean fresher food for you and I. So fresh in fact that they make their soup and other menu items in house every morning—the closest thing you’ll find to a home-cooked meal on campus. The most popular order at Engrained is the “Adult Grilled Cheese” with Tomato Basil Soup. Personally, I’m partial to the BLT or Grilled PB&J. Engrained carries a sweet line of baked goods from Chicago’s West Town Bakery that are the perfect way to finish off any meal. When you’re in the mood for a hot drink the cafe sells typical tea and coffee drinks, but if you’re looking for something a little extra special I recommend the hot chocolate or apple cider–by far the best you will find on campus. So thanks to Engrained for keeping our stomachs full of good eats that keep us–and the planet–happy. Bring on the werewolves, last minute costumes, and pumpkin flavored EVERYTHING. This is my first Halloween in Chicago, and I am beyond excited for the new experience. Realistically all that I’ll do is sit in my dorm room drinking some cider from Engrained while watching a movie, but hey. It’s the pumpkin decorations hanging on my window that make the difference. Don’t go out alone. Go with a friend or a group so ensure that you’re not wandering around Rogers Park alone at night. While we would like to ignore the fact that bad things can happen, they can. Don’t place yourself in unnecessary situations…Plus it’s more fun to go out with a few people, even if you don’t know them well! I’m not qualified to speak on costumes and whatnot, you all have fun with whatever you choose to wear, but here’s the fact of the matter: there are little white flakes coming down from the heavens. The wind is blowing more so than usual. Don’t get hypothermia just for the sake of looking good in an outfit. Bring a jacket to wear while you’re outside. You can always just take it off when you get to your destination! This seems like a no brainer. However, if your idea of fun Halloween festivities are more towards staying in and watching scary movies and less of going out and braving the weather we’re having, then do so. Do what is going to make you happy, and don’t allow yourself to be pressured to drink or party if you don’t want to. You always have the option of not doing so, your friends really won’t care if you decide it’s in your best interest to not partake in risky behavior. Everyone have a fun and safe Halloween, no matter what you decide to do! It’s finally Halloween! In the spirit of the season, Loyola has many different activities going on to celebrate Halloween around campus! In this post, I will be discussing what fun things there are to do on campus to celebrate this fun holiday. There are many things to do around Loyola on Halloween! If you feel like watching a scary movie, the cinema in the Damen Student Center will be showing a special screening of The Exorcist. If scary movies are your thing, this would definitely be an activity I would recommend attending with some friends! Also, tonight there will be a masquerade ball held in the second floor multi-purpose room in the Damen Student Center where students can dress up, dance, hang out with friends, and relax to celebrate Halloween. These activities are both free with a Loyola student ID, so be sure to check them out if you are looking for something to do this Halloween without spending any money! In addition to campus wide activities, a lot of residence halls also hold special activities to celebrate Halloween. Last night, Mertz Hall held a movie marathon with showings of everyone’s favorite Halloween movies: Halloweentown, Hocus Pocus, and The Conjuring. The diversity of movies shown appealed to many different people, whether you like kid friendly fun movies or full on thriller movies. While watching, Mertz residents were able to decorate masks and eat lots of snacks. This was a wonderful building bonding activity in the light of Halloween! Last time I wrote about picking a major, and finding what’s right for you– well this time I’m going to tell you about an awesome way to figure out just what’s right for you!… an INTERNSHIP! If you’re unfamiliar with what an internship is, it is basically the opportunity to put the skills you learn in the classroom to use. An internship can be many different things, but is typically like a part time job (but it’s all about learning). Through an internship, you get a taste of what a you potential career might look like (and whether you like it or not), and you also get some valuable experience that will help you get there in the future! This past year, I started my very first internship, and I’ve got to say that not only do I have a better idea of what the career of Public Relations entails, and I also now know that I love working in the field. While I spent the last two years learning about the things I would do, in the classroom, actually having the chance to do those things in real life showed me just how much I enjoy it! This semester I’m working at Make-A-Wish Illinois as the Communications intern, and I had not expected to enjoy the work as much as I do! Through this internship, not only do I get to do all the things that a real professional would do, but I also get to put all the stuff I learn in class to use, and out into the world! 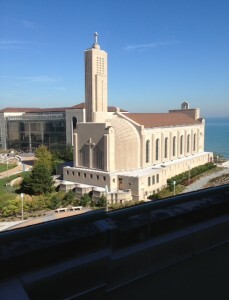 I’m so glad that Loyola is in such a wonderful city, where we have SO MANY opportunities to get this type of experience! I definitely recommend an internship for all of you! It doesn’t matter if you already know what you’re going to do, or if you have no clue– getting out there, and trying it out is the best way to get some experience! Thanks to Father Mertz’s efforts, we have this beautiful chapel today. He was responsible for fundraising and establishing Madonna della Strada, or “lady of the way” in Italian. Most interpret this title as an homage to the Blessed Virgin Mary, who leads all Catholics with her example of love and faith. 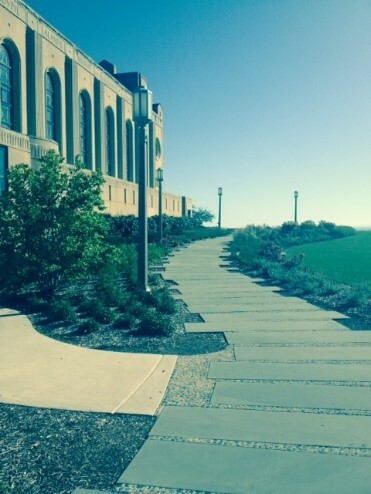 Before the chapel was built, however, Chicago planned to extend Lake Shore Drive on the grounds where Fr. Mertz wanted the chapel. Fortunately, the road plans were abandoned, and Fr. 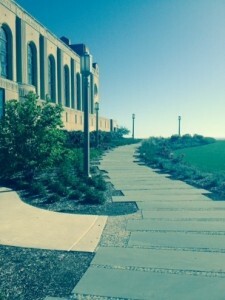 Mertz was able to carry on with building his vision in place of the extension of Lake Shore Drive’s way. Madonna della Strada exhibits not only physical beauty but also beauty in its mission lived out by the students, faculty, and organizations which work in the chapel. The ministry department at Loyola works closely with the chapel and hosts retreats, volunteer opportunities, and activities for students interested in liturgical ministry. 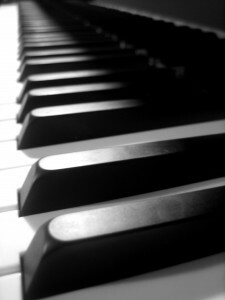 I’ve been lucky enough to participate with music ministry at MDS for the past year and a half. For Sunday masses at 10:30 AM I play violin along with musical director Steve Betancourt, clarinet Sarah F., and the liturgical choir. Through this experience with MDS I’ve learned how so many factors feed into each mass, wedding, and celebration to make it unique and special. Loyola is lucky to have such a beautiful chapel like Madonna della Strada. The chapel holds daily masses and can be reserved for weddings. Probably one of the most important factors in choosing a university to attend is knowing the quality of the food served on campus. Here at Loyola, there are many different options for food on campus. In this post, I will be discussing those different options and the quality of food served. Although sometimes you may hear horror stories about dining hall food, here at Loyola they just aren’t true! There are three dining halls on campus: DeNobili Dining, Simpson Dining, and Damen Dining. Each dining hall has a different variety of foods and often have one thing to make that dining hall unique from the rest. For example, there is a taco station in the Simpson dining hall and a pasta station in the DeNobili dining hall. This variety makes eating dining hall food exciting, as you are able to get a new meal everywhere you go and every time you go! In every dining hall, there are vegetarian and other special dietary need-based foods available. For example, there is an extensive salad bar in every hall and a wrap station in Damen where you are able to create your own salad or wrap. The dining halls also provide garden burgers in addition to regular beef burgers for those who choose to eat vegetarian selections. If something is a vegetarian selection, it will be clearly labeled in order to ease possible confusion. There is also often a home-style cooking station that will provide different hot entrees every day, and each dining hall serves breakfast. The dining halls on campus also have a very good selection of desserts! All three dining halls offer a wide range of cookies, brownies, frozen yogurt, and occasional specialty treats every day! In addition to the appeal of the wide variety of foods available in the dining halls, the quality of the food is also very good. The food is all prepared fresh by the Loyola kitchen staff and is always hot and ready to be eaten. Because the food is so fresh, it is guaranteed that the food will taste good too! Eating in the dining halls is easy! All you need for entry into a dining hall is a student ID with a meal plan! There are two options for meal plans while living on campus: the five-day meal plan and the seven-day meal plan. With these plans, a student is able to get three meals a day per how many days a week they purchase the plan for. These plans also come with extra dining dollars, which are good to use on any food item or area on campus. Senior year can be scary. It doesn’t matter if it is the senior year of high school, or the senior year of college (like me)- both hold so much expectedness! Senior year of high school, it’s all about applying to colleges and same goes for senior year of college- you’re applying to graduate school, or even jobs! If you’re a senior in high school, though, you’re probably knee deep in applying to colleges, which can be scary and overwhelming. I know that when I was in your spot three years ago, I was nervous about how the application process worked and most importantly what I was even going to spend the next four years studying. The scariest part of the application process wasn’t sending in personal statements and essays, but it was writing on that one line what it was that I wanted to study for the next four years. When I was a senior in high school, I had a general idea of what interested me, and what I could possible do- but it wasn’t until I arrived at Loyola that I was able to see all the different options I had, and choose the best one for me. If you’re feeling any of the ways that I was, I’m here to tell you that it’s okay to not know. It’s okay to not know if you want to go into the Pre-Med field, the business world, the communications field– whatever it is… it’s okay. Of course, there is nothing wrong with knowing exactly what you want to do, but more than anything I want to let you know that having an “Undecided major” is not a bad thing. During your first year of college, one of your main academic objects is to figure out what most interests you. During this time you might realize your deep passion for something you may have never imagined, or maybe that something that you thought you would enjoy, doesn’t really interest you. This is exactly why the first year of college is so special. This is the time where you get the opportunity to figure out what you are interested in and what truly “speaks to you”! At Loyola, you get the wonderful opportunity to take classes in various subjects through the CORE, and this is the best way to get a little taste of everything! For me, I was able to find a wonderful minor that I truly enjoy, and even specify my major to exactly what I would love to do for the rest of my life– through the classes I took my first year at Loyola! I hope that if you were anxious about picking a major or track of study, this post helped ease your anxiety! Loyola’s Department of Programming strives to “provide students with a variety of activities to enhance the Loyola experience.” DOP sponsors a multitude of events throughout the school year and their Facebook page keeps everyone in the loop! The DOP page contains information about exciting activities, which are almost always free for students, and lets you know when the Damen Info Desk is selling discounted tickets to fun events like Fright Fest. Your graduating class page is a great resource for finding a roommate, asking general questions, and sharing information with classmates. This page will undoubtedly become more valuable as you encounter more obstacles throughout the school year, like, not knowing which classes to take (or professors to choose) in the upcoming semester. Liking your resident hall page will help you stay tuned in, and hopefully involved, with what is going on around you, as in, right down the hall. Sometimes, the RAs will host small activities to help students take a break from studying and the details will be posted on the page. Check it out. You may be surprised to discover how little you know about how much your RA does in an effort to dial up your residence hall’s happiness factor. Although this page is not affiliated with Loyola, LUC Love Notes allows you to anonymously post ‘flirts’ to other students around campus. The page is falls somewhere between a confessions and a compliments page. LUC Love Notes always has the cutest posts and is sure to make you laugh and smile. Probably one of the funniest pages about Loyola because all the posts are memorable and distinct quotes from professors. When you read posts about your professors, you won’t be able to help but chuckle and nod in amazement at how a short quote captures their personalities and those endearing quirks that make them unique. Whenever you join an organization on campus, like its Facebook page. Most of the time, clubs will post all their information and events on the page. Instead of confronting a slew of emails, everything you need is nearly gathered in one place. 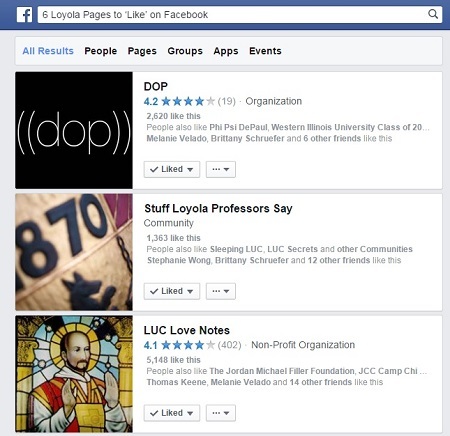 You can even like pages of organizations you aren’t in but are interested in keeping up with, like USGA or LUC Sorority & Fraternity Life. Writing about my travels abroad in my last post really made me miss Rome. And since I could not immediately get on a plane and fly there, I decided to search for a little piece of Rome in Chicago. So where can I find a place to relive my memories? Eataly of course! Eataly is located at 43 E. Ohio Street and is easily one of the best places to visit when in Chicago. This place is as close to Italian authenticity as you can get. There are two floors to Eataly. On the first floor are all their deserts and sweet shops, including a full Nutella desert station AND a pasty station AND a gelato station. It is like desert Heaven! I myself opted for the gelato station since I absolutely adore gelato and wanted to see if the gelato was even remotely close to Italian gelato. I ordered a dark chocolate gelato (because that is the best flavor of them all) and was completely blown away. It was delicious and was the exact creaminess and flavor of Italys. One the second level there are the restaurants and fresh produce sections. They have a restaurant that serves meat, one that serves fish, one for paninis, and one for pizzas and pastas. I decided on the pizza and pasta restaurant. I ordered the Capricciosa pizza which had fresh mozzarella, mushrooms, prosciutto (Italian ham), and artichokes. It was wonderful! It was made with super fresh ingredients and baked in the traditional Italian style with the edges burnt and the pizza so thin that you have to eat it with a fork. The pizza itself is perfect for two people, or you can just get one and take some home, because who would not want to relive the deliciousness?! The servers were extremely friendly and willing to answer any questions you may have on the menu. Finally, to round out my trip down memory lane, I checked out the fresh produce sections. They have freshly made cheese to buy, handmade pasta, fresh fish, and prime meat cuts. They also have a whole vegetable and fruit section. Not wanting to go home empty handed, I bought some blood oranges in this section. Needless to say, they were also spectacular in taste. No surprise there! Eataly is not only a restaurant and grocery store. They also offer cooking classes! You can learn how to make pastas, pizzas, and other such dishes from Italy. You can also hold private dining events there. Eataly took me back to eating outside of a café on a cobblestone alley street in Rome. I already can’t wait to go back and taste more of Italy in Chicago!